Ten years ago, Audi had one SUV in its lineup, and it accounted for barely 15% of the brand’s sales. Last year, SUVs and crossovers represented over half of all Audi sales, and the trend continues this year, inching closer to 55 percent of the German luxury brand’s volume. While it’s tempting to think that most of that is from the brand’s bestselling Q5, Audi sold over 38,000 larger, more expensive Q7s in the US last year, no doubt generating huge profits for the brand to keep building R8s and weird five-cylinder turbos. With a subcompact Q3 bringing new buyers to the brand and the soon-to-arrive e-tron Quattro representing the future and appealing to technophiles ready to make the leap to electric power, Audi has not forgotten about the high luxury customer looking for the poshest, fanciest ride at the club. Granted, the Volkswagen Group already has the and Lamborghini Urus catering to the ultra-luxury crowd, but there was more than $100,000 of space from the fully loaded Q7 to the Bentayga base price, and plenty of customers looking to spend money like that on an SUV instead of one of Audi A8 or A7 executive sedans. The Porsche Cayenne plays in that space, but it is the sporty one to Audi's luxury mission. Audi aims to fill that void with the 2019 Q8 as its new top premium SUV, inheriting the Q7’s platform with the same 117.9-inch wheelbase, but ditching the third row, widening the stance, and chopping over three inches from its tail and significantly more from its roofline for a sportier appearance. It’s still a large vehicle and will provide ample room inside for the five or four passengers lucky enough to ride in it. In an attempt to evoke the legendary Ur Quattro Coupe, they’ve added a bit of black plastic stretching between the taillights. I don’t really see the resemblance, other than that the Ur Quattro also had black plastic between the taillights and a full-width light strip. But the designs are generations removed and light years different, so it comes off as the usual marketing blather. While I don’t see the resemblance, the Q8 still has a striking profile, but the jury is still out on the latest version of Audi’s Singleframe grille, which seems to have had another growth spurt and take over even more of the front nose’s real estate. Under the hood, many expect the Q8 to mirror the Q7’s drivetrain, namely the 333-hp supercharged 3.0T paired with an eight-speed automatic, but Audi has confirmed that it will launch with the 48-volt mild hybrid system and the standard Quattro all-wheel drive will have a 60/40 rear-drive bias for mildly sportier dynamics. Then again, the A8’s base powertrain is a newer turbocharged 3.0 TFSI V6 making 335 hp and 369 lb-ft, so it’s a possibility as well. Adaptive damping will also be standard, while air suspension will be optional, allowing the Q8 to rise above obstacles in Offroad mode. While there is no mention of autonomous driving, expect the same kind of toys as the and A7, at most Level 2 adaptive cruise control system with steering, acceleration and full braking support . Other than that, mechanical details are scant, but spy shots indicate an even . To the best of our knowledge, the Q8 will take the turbocharged 3.0L V6 and again add some hybrid boost to take it to 470 hp and over 500 lb-ft of torque. A 20-kWh electric motor would certainly help it launch with a nice kick of electric torque, reportedly dispatching 60 mph in under 5 seconds. But remember, the Q8 Concept was theoretically powered by a twin-turbo 3.0L V6 with a 0.9-kWh lithium-ion battery estimated at a needlessly specific 469 hp. We’re getting ahead of ourselves with the SQ8 that will play with the X6 xDrive50i and GLE 53 AMG, never mind the RS Q8 rumored to be in the works to take on top performance models like the X6 M and Cayenne Turbo. Audi also announced the next evolution of the MMI infotainment system, which it claims is “as intuitive as a smartphone” thanks to acoustic and haptic feedback on the touchscreen-based system. In other words, the screen clicks and buzzes when you press an icon or menu selection, and menus can now be reconfigured to make your favorite functions more immediately accessible. Behind the steering wheel we see Audi’s usual 12.3-inch virtual cockpit that allows for most functions to be controlled right from the steering wheel. There will also be wireless charging, in-car hotspot, massaging seats, a spectacular Bang & Olufsen sound system and other tech in a cabin that looks like the flight deck of one of the USS Enterprise’s shuttles. With the third row deleted, it will be plenty spacious for even tall adults in all four seats, and while trunk capacity isn’t mentioned, there will be up to 63 cubic feet of cargo space with the rear seats folded. 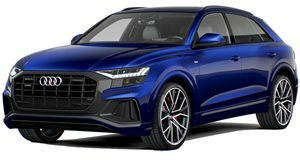 While practicality takes a back seat to style in this SUV, the 2019 Audi Q8 is big enough that it will barely be noticed, and it will make for a competitive alternative to crossovers with coupe aspirations from Mercedes and BMW with a less challenging design and Audi’s cutting edge technology and impeccable cabins. Although there is much more information to come, it will be rolling out soon as the Q8 will be in showrooms before the end of this year.